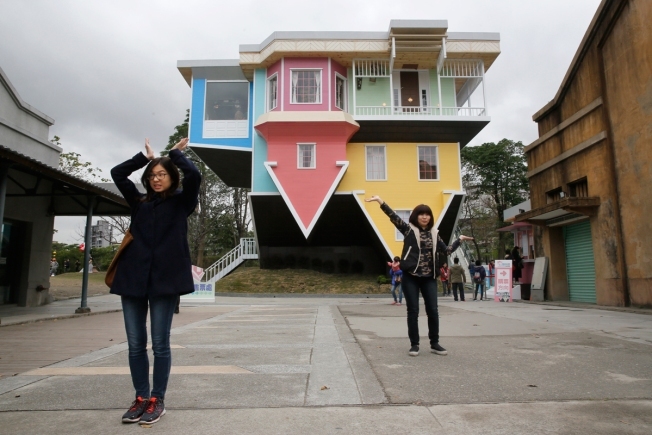 Building and designing a new house of your own may seem like a topsy-turvy experience. For a group of architects in Taiwan, it certainly was. On commission from Taiwan's Culture Department, they designed and built an ordinary American family house. The colorful home has three floors, a master bedroom and bath, and a garage. And the house and everything inside it — from the car to the appliances to the toys on the floor — are upside down. It has just over 300 square meters (3,229 square feet) of ceiling, er...make that floor, space. The car in the garage is attached to the ceiling. An outdoor staircase at ground level leads to the third-floor living room and its ceiling furniture. Its appliances are real, with working lights throughout. The overhead fireplace, though, was an LCD screen of a cozy fire. The designers paid close attention to details: the pasta on the dinner table hangs vertically as do the bathroom towels, and a computer in the study has yellow sticky notes attached to it. The project is on display at the Huashan Creative Park, a site that was once a Japanese plum wine factory but has been turned into an arty warehouse with hip restaurants and a theater showing independent films.